Wine & Roses® Weigela is likely one of the best flowering shrubs on the market today! 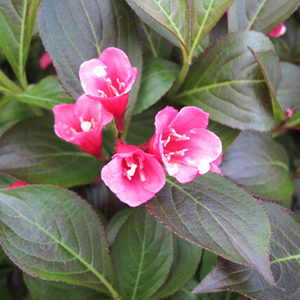 This award winning Weigela has dark burgundy-purple leaves that resemble the color of a fine wine. The romantic rose-pink flowers complete the ensemble for a lovely display in early summer. As the season progresses the dark foliage color intensifies even more to near black! Wine & Roses® makes a wonderful specimen plant for the back of the border. Hummingbirds also love the brightly colored flowers! A Proven Winners® ColorChoice® Flowering Shrub.